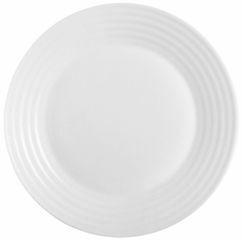 This white opal dessert plate from the Harena collection is manufactured by Arc International. Known for its resistance to shocks, the opal material also has a high thermal resistance. Composed of circular lines combining simplicity and modernity, the Harena collection is suitable for all types of tables. This white dessert plate will become your ideal partner for a fully successful meal. Labi iepakoti, precīza piegāde. Paldies!! !